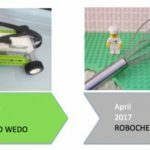 Dr. E’s WeDo Challenges and Dr. E’s MINDSTORMS Challenges encourage students from around the world to solve open-ended LEGO robotics challenges and post their solutions for other students to see. Here are the upcoming MINDSTORMS Challenges for this cycle. Make a MINDSTORMS creepy crawly—a worm, a bug, a spider, or any creepy-crawly creature. Make a MINDSTORMS device to help manage money. E.g. a piggy bank with an alarm, a coin sorter, a money counter. Create a device to improve human capabilities—an arm that can reach high shelves, eyes that can see infrared in addition to visible light—or whatever improvement you can imagine. Here are the upcoming WeDo Challenges for this cycle. Rewrite a familiar story to star a robot as one of the major characters. Show us a scene from your story. Goldibot and the Three Bears? Harry Botter and the Chamber of Secrets? Make a WeDo creepy crawly—a worm, a bug, a spider, or any creepy-crawly creature. It is easy to lose track of time. Create a WeDo time-keeping device to help you count the minutes. Create a device to improve human capabilities. Barbara teaches at the Shady Hill School in Cambridge, Massachusetts and works at the Center for Engineering and Education Outreach at Tufts University. She is the author of several LEGO robotics activity books for teachers, most recently STEM by Design.